Update: My host, Seth has responded from his community blog. I’ve been an observer of the browser market for some time, since I live much of my awake live within one, and have been privy to interview the IE7 team on their launch, and also have been recently got a demo from Flock’s CEO (my thoughts on the opportunities). Seth Bindernagel, of Mozilla’s Evangelism team invited me to swing by the Mountain View headquarters, I was in luck, as there were folks from out of town like Gen Kanai (Japan) that I’ve been wanting to meet for quite some time. As soon as I walked in the door, it was apparent these was a very, very savvy web team, so I wasn’t sure how much value I could add. Seth and I discussed in advance that success would be to get the teams to talk about the globalization of the web, how different users share products, and how social media impacts product adoption. You see for Firefox, and other Mozilla products, adoption is often done by customer word of mouth and referral –and blogs empower much of this. There were a few main topics we hit: From Technographics (how different people use technologies depending on their needs) Early adopters vs Laggerds, and how Marketing and Product teams can improve to listen and talk. For most of these topics, each of the respective teams (Executives, Marketing, User Experience, Analytics, Engineering) had a response, so they were for the most part moving forward. Each culture shares differently online, and when you’re applying social media products (which encourage sharing) you need to be sensitive to understand if they are: creators, joiners, critics, collectors, consumers or inactives. Will internet users that just consume the web, and just visit a few websites a week be interested in the advanced functionality of Mozilla products? The web is a fascinating medium, many companies think that by slapping on a .cn or a .de, doing some navigation localization will be enough to get product adoption…rarely is that the case. For Firefox, many of the early adopters are the ones that are ‘sneezing’ the product to others, and Mozilla has been great reaching to those folks. But what happens when the early adopter market becomes saturated with Firefox and now the focus has to shift down the adoption curve. Should Mozilla rely on ‘traditional’ marketing and advertising? Stay tuned, I did a couple of web strategy videos talking about social media, marketing in Japanese and European perspectives, and even how to improve products with community, so stay tuned over the next few weeks for those. Oh, and one of the employees (was it John?) 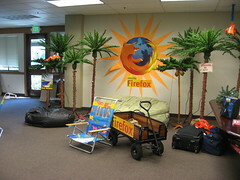 made some funny remarks how Firefox was the greatest thing for IE6 innovation, do you agree or disagree?